Early this year, the Government of Belize (GOB) confirmed that they had set up a special committee to liaise with investors of Norwegian Cruise Line (NCL) for a proposed cruise port on Crawl Caye. The latest development is that GOB has endorsed a memorandum of understanding (MOU) with NCL regarding the development on Harvest Caye. This change of location came about after stakeholders in the tourism industry in southern Belize, resoundingly rejected any form of development on Crawl Caye. News of the original proposed cruise port at Crawl Caye caused much controversy when environmentalists and tourism stakeholders claimed that Crawl Caye is within the UNESCO World Heritage Site and the port would create serious damage to the sensitive marine ecosystem. Also causing much concern to the public was the serious concessions that GOB was making to accommodate the NCL project. These included exemption from stamp taxes, customs duties and general tax holidays/waivers for a period of 30 years, with two additional 15-year-extensions to be used at the cruise line’s discretion. They would also enjoy an exclusive 30-year concession as a cruise port of entry at multiple locations in the Stann Creek District in southern Belize, again with two additional 15-year-extensions to be used at their discretion. After the negative public response the Crawl Caye proposal received, GOB announced that Cabinet had turned down the NCL proposal, but would continue searching for new sites in southern Belize. Shortly thereafter, GOB started to consider Harvest Caye, which lies outside the protected zone of the World Heritage Site. However, the problem with a port being constructed at Harvest Caye is that the potential development of the island could possibly interrupt local commerce on the Placencia Peninsula. One particular organization that has strongly opposed the NCL’s proposed project is the Placencia Chapter of the Belize Tourism Industry Association (BTIA). The organization, whose main objective is to promote tourism while protecting the interest of its membership, has led the charge against the NCL project. In a press release, the Placencia Chapter of BTIA explained why they are against the project. “We find it inexplicable that Cabinet could reject Norwegian Cruise Line’s proposal for a cruise port at Crawl Caye, yet simultaneously encourage the company to find an alternate site, in this case Harvest Caye…. 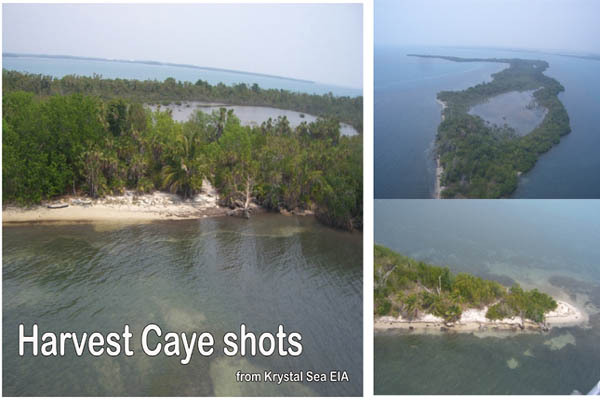 Although Harvest Caye does not lie within a marine protected area, the same negative environmental impacts resulting from excessive visitor pressure remain…. Most importantly, however, the development of a large cruise port in the south inexorably commits the area to an economic future based on mass cruise tourism. This type of mass tourism is 180 degrees opposite from the path of low impact overnight tourism that has brought the Placencia Peninsula so much success,” stated the press release dated Thursday July 18th. The Placencia Tour Guide Association has also gone on record to state that the construction of the cruise port would create an overpopulation of visitors without the resources to accommodate the large numbers. The Placencia Peninsula tour operators also claim that cruise ship tourism will cause significant degradation of fragile marine and inland environments such as coral reefs, fish and bird habitats which would be catastrophic for Placencia’s development. BTIA Placencia Chapter has also been very vocal against the Minister of Tourism Manuel Heredia Jr and his Chief Executive Officer Tracy Taegar Panton. “The fact is that the campaign to inflict mass cruise tourism on southern Belize does not have its origins in any part of the South; it is simply part of a long running effort by one government official and a small group of associates whose motives have nothing to do with developing our community and everything to do with enriching themselves. We note with increasing disappointment the failure of the Ministry of Tourism to come forward with its position on this issue. Having spent hundreds of thousands of tax payers’ dollars on independent studies and successfully convinced Cabinet to endorse a Sustainable Master Plan that clearly prohibits mass cruise tourism in the South, the Minister and CEO are suddenly missing in action. We can understand that ministers are busy and cannot read every lengthy document introduced for endorsement by cabinet, but surely the Minister of Tourism and the CEO have read their own policy…or have they? Mr. Heredia and Mrs. Panton, your silence is deafening,” adds the release. The Placencia BTIA release comes a few days before a draft MOU between NCL and the GOB was leaked out to the press on Monday July 22nd. The MOU is currently before the Solicitor General’s office for review after GOB’s Cabinet had endorsed it. It outlines what many environmentalists claims is a “pittance” that Belizeans would get from such activity should it materializes. According to the draft MOU, NCL will get to keep more than half of the $7US dollar head tax GOB collects - the Belize Tourism Board (BTB) would get US $1.60, the Protected Area Conservation Trust (PACT) will keep US $1.40 while NCL will get the rest, US $4.00 per person. But what is even worse is that of PACT and BTB’s minority take, they both would have to apportion - in the BTB’s case - 50 cents per person to a tourism development fund, to be used on southern Belize – thus developing product for the Port owners. And out of PACT’s share, 25 cents US would go to environmental monitoring – which, is not a function of PACT. According to environmentalist that cost should be borne by the Port owner, not paid from the head tax. NCL has allocated US$50 million for the Harvest Caye proposal claiming that they will employ no more than 25% foreign staff. Commenting on the MOU, as well as the proposed development, Steward Krohn Chairman of Placencia BTIA Chapter, referred to it as “disappointing” and “insane.” “That the Government and Ministry of Tourism would even contemplate the introduction of mass cruise tourism to the South is disappointing; that they would sign an MOU with Norwegian Cruise Line that gives away the candy store is not only insane but makes one wonder what they are smoking in that Cabinet room. If Minister Heredia and CEO Panton have an explanation, we would love to hear it,” said Krohn. For its part, GOB is stressing the importance of foreign investment and development, with the idea that the creation of the port will not only bring in foreign exchange but will also create jobs that will lead to the development of Southern Belize. Prime Minister of Belize, Honorable Dean Barrow has also confirmed that the Harvest Caye cruise port proposal needs an overnight facility. GOB has already approved a resort development for the same Harvest Caye location, which includes an airstrip and a 150-room hotel with villas over the water. Barrow had originally stated that Cabinet is in no way near to approving the project and that all protocols will be met in the discussion of the cruise port. While the Cabinet has endorsed the draft MOU, indirectly signaling approval to the project, the Placencia Peninsula tour operators along with many tourism stakeholders will continue to defend their cause as well. NCL remains optimistic that the Cabinet will favor the Harvest Caye cruise port proposal.